HINT: The installation is in the reverse order of the removal. However, when there is a special point concerning the installation, it is indicated. 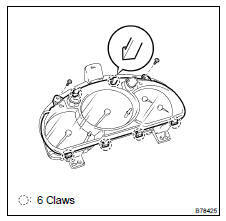 (b) Disengage the 6 claws and remove the combination meter glass.